In a Nutshell: The Listia platform serves more than 10 million registered users who buy, sell, and trade collectibles and other used items. Initially, it relied on stored-value credits to enable those transactions, but in 2018, Listia converted to a blockchain-based platform offering its own Ink Protocol and XNK cryptocurrency. That conversion not only makes transactions more secure but it also provides users with more control over their transactional history. And Listia is rolling out a new platform that allows buyers and sellers to showcase their online reputations across marketplace platforms. Listia got its start in 2009 as a marketplace where people could trade collectibles and other used items without exchanging money. The platform accomplished that by introducing an internal system of stored-value credits to the traditional bartering process. Buyers offered items for auction and earned credits to save and spend on other items. Because it was easy for buyers and sellers to make trades on the site, Listia quickly emerged as a preferred destination for bargain hunters and those who wanted to declutter their lives. And, in this age of “KonMari” — the lifestyle brand that inspires people to tidy their lives — Listia remains an indispensable tool for those looking to get rid of items that no longer spark joy. Listia Co-Founder and CEO Gee Chuang told us that users find listing and trading items on the platform fun. Today, more than 10 million registered users turn to Listia not only to clear out space in their closets, but also to find bargains on collectibles, gadgets, jewelry, and much more. Over the years, Listia has innovated to accommodate sellers offering fixed-price items. Although the service extracts a small fee from fixed-price transactions, auction participants still get to play for free. Since its founding, Listia has enabled more than 100 million transactions. And, to allow hundreds of millions more, it is making changes that will position it well for the future. It all starts with the company’s move away from stored-value credits and into the more efficient and secure world of blockchain technology. With recent changes, including the development of its own cryptocurrency, Listia looks to broaden the buying, selling, and trading power of its users. As Listia was growing into an ecommerce powerhouse, cryptocurrencies like Bitcoin were emerging as possible alternatives to conventional forms of money. But what makes bitcoin and other cryptocurrencies possible is the fascinating blockchain technology underlying them. Blockchains store data in linked, cryptographically secure packets that are replicated across a computer network. This linking and replication not only makes blockchain data impervious to hacking but also eliminates the need for a central platform — like a bank, for example — to act as an intermediary between individuals looking to transact with one another. In 2018, Listia transformed its internal stored-value credit system into a blockchain platform based on Ink Protocol and trading XNK cryptocurrency, also known as Ink. Listia uses Ink Protocol not just to support Ink cryptocurrency for buyers, sellers, and traders on its blockchain but also to store user data and service applications that formerly resided on Listia’s servers. And that opens up a whole new world of opportunity for users both on and off the Listia platform. Blockchain technology takes data control away from the platform and puts it in the hands of users. It also renders old ways of storing user information on central servers obsolete. As a user painstakingly builds a profile, transaction history, and review reputation on a centralized platform, there’s no way to transfer that information to another platform or account for transactions occurring elsewhere. If a seller lists the same item on more than one platform, there’s a danger it could be sold twice. And a buyer on one platform has no way to take a seller’s reputation earned on another platform into account. Listia saw the need for a tool that allows users to access the data and reputation they’ve accumulated on its platform and apply it to others. Now, integrating with payment giant Paypal, Listia has built that tool — Replin. 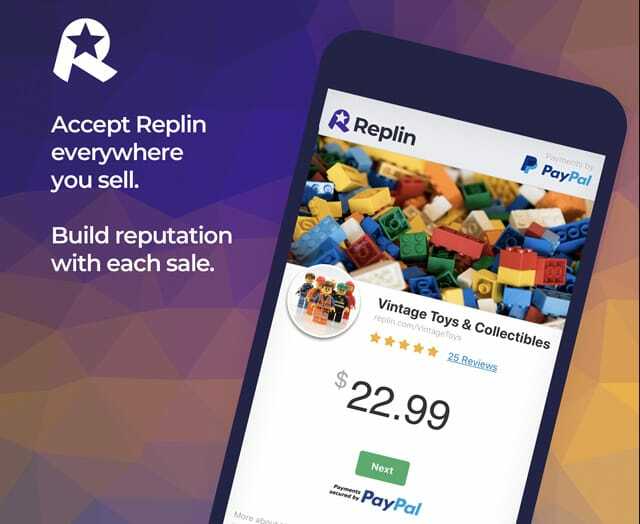 With Replin, users can leverage their reviews and reputations across marketplace platforms. Adding even more flexibility is the integration with Paypal, which allows sellers to leverage their profile and reputational data on Replin while accepting a wide range of payment types. With Paypal handling the funds, buyers can leave feedback on Replin that sellers can carry over to other platforms. And because Replin is linked to Ink Protocol through the blockchain, no central third-party owns or controls the seller’s data. Blockchain technology is still in its early days, but by moving to Ink Protocol and rolling out Replin, Listia is bringing its benefits to online marketplaces — and decentralization closer to fruition. According to Gee, in typical online transactions, a consumer finds a desired product on a marketplace platform, researches the seller’s reputation, and buys the product if everything checks out. What Listia is doing with Replin is removing the platform from the equation while enabling buyers and sellers to retain the same sense of trust and security. An open-source, scalable solution that enables buyers and sellers to feel as comfortable transacting directly with each other isn’t built overnight. “Ink Protocol and Replin take what we’ve been working on since 2009 and build it into a single platform with global potential,” Gee said. With that dedication comes many advantages. For example, centrally stored data is vulnerable to hacking in a way that blockchain-based data simply isn’t. And platform providers also must extract fees for their services, often raising costs and adding inefficiencies. Meanwhile, platform-centric internet users must cede ownership of their identities and reputations to the platforms they use. Listia’s Ink Protocol and Replin app are emerging as an antidote to those problems, capable of securely carrying all types of data and enabling parties to buy, sell, and trade without the need for intermediaries. And that is moving the blockchain closer to practicality.